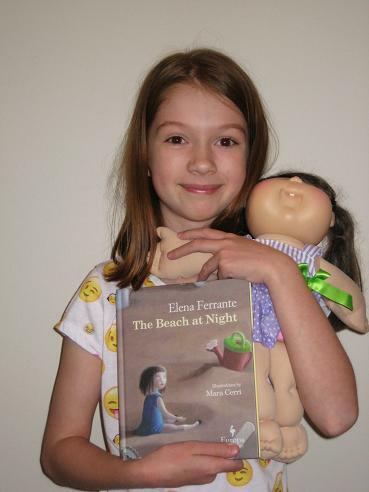 The book is called The Beach at Night and it’s by Elena Ferrante (and it’s translated by Ann Goldstein). It’s about a doll who gets left behind by her ‘momma’ at the beach, who then goes on many adventures to try and keep herself safe and get back home to her mum, Mati. First, she gets swept up by the mean beach attendant’s best friend ‘rake’. Then, she gets scared she’s going to get a fever just like her mum always tells her. Finally, she gets washed away by the waves until she gets picked up Mati’s pet cat, Minù. It was OK, not my favourite book ever. I didn’t really like how she said everyone was a living thing, like the waves and the storm. I also didn’t like how the mean beach attendant kept on swearing and swearing (don’t tell my Dad!). The pictures were nice, but a bit repetitive, just her lying in the sand or the water. The Beach at Night may have been inspired by the story of the doll from The Lost Daughter, but in truth it isn’t really that closely linked. It’s more a reimagining of the doll’s time away from the little girl, with several differences including a change of names and the addition of a brother. What comes across very strongly is the bizarre nature of the tale as we follow the lost doll through a worrying, lonely night. I don’t like this cat Minù, in fact I hate him. Even his name is ugly. I hope he has diarrhea and vomits and stinks so much that Mati is grossed out and gets rid of him. As Celina is pushed around the beach, escapes a fiery demise and is finally washed out to sea, any child reading could well be forgiven for wondering, as Emily did, whether this is really for kids at all. Re: moral—oh, and make sure you read books before you give them to your kids.